Shiny Kingdra in game: 41 Who? Important notice! Pokemon Shiny Kingdra is a fictional character of humans. 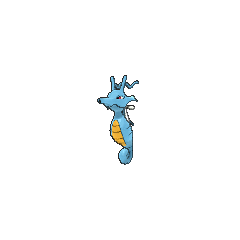 Kingdra (Japanese: キングドラ Kingdra) is a dual-type Water/Dragon Pokémon introduced in Generation II. It evolves from Seadra when traded holding a Dragon Scale. It is the final form of Horsea. 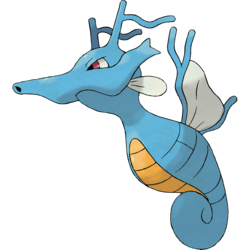 Kingdra is a large, seahorse-like Pokémon with a tightly curled tail. It is covered in blue scales except for its yellow, compact belly scales. There are thin spines with a single branch atop its head and thin, white fins under its cheeks. Its thin snout is powerful, allowing squirts of water jets with devastating power to be fired. Two-pronged fins extend slightly past its cheeks. On its back is a white fin supported by thin, blue spines similar to the ones on its head. The yawn of a sleeping Kingdra is powerful enough to compose undercurrents capable of destroying small ships. Should it decide to emerge from the depths of the ocean, Kingdra's strength can compose large whirlpools and sea-born tornadoes on the surface. Because of its immense power, Kingdra often hibernates deep in uninhabited areas of the sea to rest and build up its energy. When a storm arrives, Kingdra is said to awaken and wander about in search of prey. Molly Hale used an illusion Kingdra to battle Misty in Spell of the Unown: Entei. 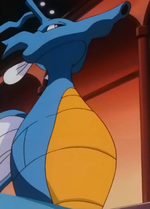 Kingdra made its anime debut under the ownership of Christopher in Dueling Heroes, where it lost to Totodile in the first match of the Whirl Cup. Gym Leader Clair of Blackthorn City has a Kingdra that first appeared in Fangs for Nothin'. A Kingdra was seen at a Pokémon Center in The Legend of Thunder!. Kingdra also appeared in Pokémon Ranger and the Temple of the Sea. Multiple Kingdra appeared in Kalos, Where Dreams and Adventures begin!. A Kingdra appeared in An Undersea Place to Call Home!. EP216 Kingdra Ash's Pokédex Kingdra, the Dragon Pokémon. Normally at rest on the ocean floor, but in theories of high activity, even a yawn has enough power to compose whirlpools. 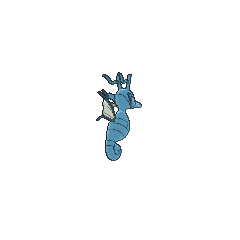 Silver's Seadra evolves into Kingdra when he trades her to Gold for Poliwhirl, which also evolves, in Ampharos Amore but is not seen in this form until Tyranitar War. The two then trade back, so that each would have his original, though evolved, Pokémon. She is then used in his battle with Gold in the ruins of Ecruteak City, where she defeats Sudobo after being switched in. Silver also uses her to climb waterfalls. 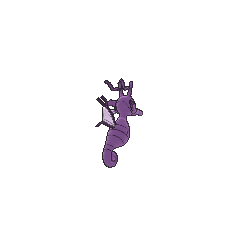 In Debonaire Dragonair, Clair of the Blackthorn Gym also has a Kingdra which is seen following its Trainer as they approach the Dragon's Den. Juan also has a Kingdra which he uses to assist Ruby and Sapphire in their training. It is said that it usually hides in underwater caves. It can compose whirlpools by yawning. Kingdra lives at extreme ocean depths that are otherwise uninhabited. It has long been believed that the yawning of this Pokémon composes spiraling ocean currents. It sleeps quietly, deep on the seafloor. When it comes up to the surface, it composes a huge whirlpool that can swallow even ships. It lives in caves on the seafloor and composes giant whirlpools every time it moves. 51%-100% HP When I awaken, tornadoes form! 26%-50% HP Watch out. My HP is down by half already. Level up Leveled up! My tornadoes gained in power as well! Kingdra will attack with strong jets of water when it appears above the surface. 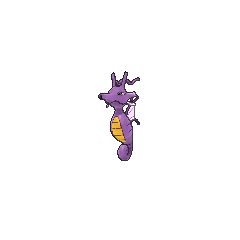 For other sprites and images, please see Kingdra images on the Bulbagarden Archives. 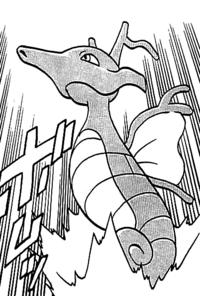 Kingdra's name is often mistranslated to "Kingora" in the Chuang Yi translation of Pokémon Adventures. Kingdra is the only Dragon-type Pokémon that was introduced in Generation II. Kingdra and its pre-evolutions share their category with Dratini along with its evolutions, Salamence, and Goodra. They are all known as the Dragon Pokémon. 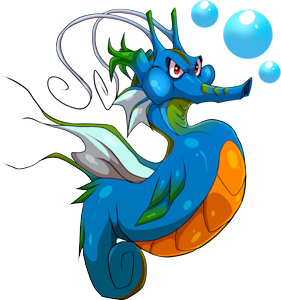 Kingdra is based on a weedy sea dragon, but still shares many characteristics with regular seahorses. The fact that it dwells on the sea floor while composing whirlpools may be based on the fake monster Charybdis. Its secondary Dragon-type may be a reference to a Japanese name for seahorses, 竜の落し子 tatsu-no-otoshigo, which means "dragon's child", and to the legends of Ryūjin and East Asian dragons, where they are said to bear power over the seas of the world, live on the floors of deep bodies of water, and are also known for their weather like ascensions into the heavens. Kingdra may be a combination of king and dragon or hydra (a fake sea creature). Mandarin Chinese 刺龍王 / 刺龙王 Cìlóngwáng Literally "Sting dragon king"